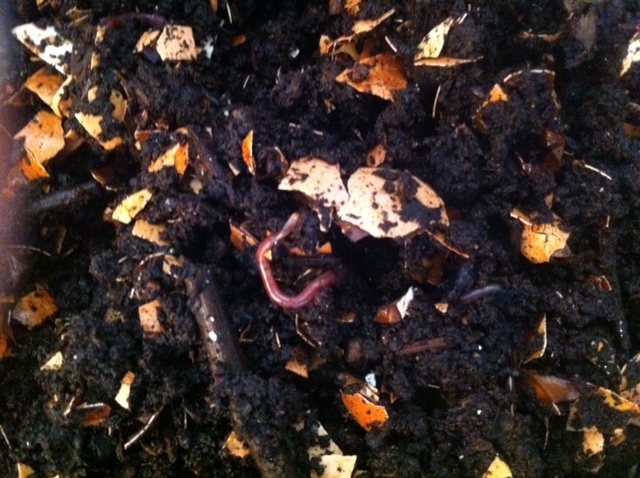 Despite my former pesky problems, my worm bin is doing great. 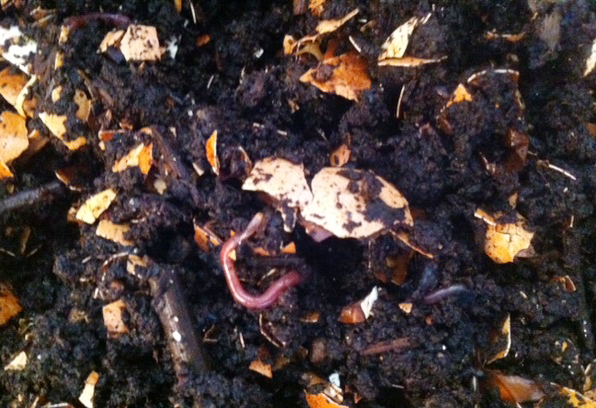 Today, I lifted up the top strata and found a rich, beautiful layer of compost dotted with egg shells (which seem to be the last to decompose) and thick with fat happy, wriggly worms. Finally, my battle with the fruit flies seems to be at a truce. But, I have happy news for anyone in the neighborhood (or TriBeCa or the Village) who wants to compost but isn’t into worms. Starting next weekend, March 5th to be exact, the Greenmarkets in Inwood, Greenwich Village and TriBeCa will join Union Square Greenmarket and begin to collect compostable kitchen scraps. During this temporary pilot program Greenmarket groupies in these neighborhoods will be able to drop off fruit and vegetable scraps to be hauled away to to facility to become compost. In case you don’t know, according to the GrowNY, food comprises about 17% of NYC’s waste stream. Food when it’s composted turns back into nutrients that can enrich soil, but when it’s sent a landfill it costs the city money to dispose and can create greenhouse gas emissions. It’s a literal waste. I’ve blogged about the impact of composting before, but I want to remind myself and everyone that this is an easy way to make a difference and for those of us who live near these Saturday Greenmarkets, it just got easier. Meat, chicken, fish, greasy food scraps, fat, oil, dairy, dog or cat feces, kitty litter, coal or charcoal, coconuts, diseased and/or insect-infested houseplants or soil are all no-nos. If holding on to scraps until Saturday sounds messy, here’s the trick — you throw it all in a bag in the freezer or the fridge and it minimizes the ick factor. The pilot will only run until June 30, 2011. If it’s a success, it will become permanent and other markets will adopt the program. I want to find out what success means. I’ll call around on Monday and see if I can find out. I also believe that fresh compost from this program will be available for purchase in these markets — but again, I need to confirm whether or not this is true. I have to admit, when I first took the bacon out of its package, I was surprised by its very unstrip-like quality. As I lay it on my tray to stick in the broiler, each slab looked more like a paper-thin pork chop. But cooked, it reformed into a fairly traditional bacon-like mass. Unfortunately, I have to agree, overall it tasted a bit more like back flavored sawdust. It’s hard to believe that this kind of thinking has been around and been being practiced since I was a kid. It’s also hard to believe that despite the banter about conscience eating and the increasing organic movement, for the most part, unfortunately the worldview is still pretty much “materialistic and mechanistic.” Think about the difficulty the organic movement is having fighting the introduction of more and more GMO crops. But actually, by 1972, this kind of thinking about food and farming was already 50 years old. Hawthorne Valley is a Demeter certified biodynamic farm. That means it follows the practices of Rudolf Steiner – a scientist, philosopher, and founder of the Waldorf School. Back in 1924, a group of European farmers approached Rudolf Steiner. The farmers were noticing that seed fertility, crop vitality and animal health was declining. Steiner held a series of lectures that talked about the farm as self-contained and self-sustaining living organism. He believed that the farm should be “individualized” and that the farmer shouldn’t bring outside materials onto the farm. Instead, the farm was responsible for creating and maintaining its own health. In this way, biodynamic agriculture is not just about being organic – it’s about growing the grain that feeds the chickens right on the farm and then fertilizing the pasture with the manure from the cows. A biodynamic farm everything is local and everything works in harmony. Sounds like something worth seeing. The goods news is at Hawthorn Valley Farms you can. They have a lot of educational programs and some of the programs look super cool are for kids. They have a farm and arts program where kids from anywhere are invited to participate in a bunch of different workshops, events and farm experiences. Some of these programs look camp like – i.e a two-week Kids Can Cook course. But others are day trips like a day at the farm where kids can milk a cow, feed the pigs, herd the cattle or other activities for 50.00/per activity. That fees covers the cost of up to two adults with up to two children. Truthfully, although I blog about meat a lot, I am down to eating red meat only a few times a month. Bacon, is still a treat I will get the kids, and maybe that’s why I’m picky if it’s not totally delicious. I will probably give Hawthorn Valley Farm bacon a second date, but until then, it gets an apologetic thumbs down. On the other hand, I am interested in visiting the Hawthorn Valley Farms some time later this Spring or next summer to check out their educational programs and their farm stand too. Taste testing my Jersey Crushed Tomatoes. Figuring out why my chicken has to eat GMO feed. What’s the story with those Jersey Farms Crushed Tomatoes? This winter, I’ve used approximately 6 cans of canned tomatoes and three jars of sauce. I’ve been keeping track – so that next year, when tomato season hits, I can make an educated decision about how many tomatoes to cook and store. That is, unless I hit the Holy Grail of canned tomatoes before then. (Meaning someone else with a bigger kitchen has canned them.) I’m trying to figure out if Jersey Farms Crushed Tomatoes are what I’ve been searching for. Last week, my friend Greg turned me on to a Tasting Table post about another local resource for canned tomatoes: Jersey Farms Crushed Tomatoes. Apparently this is the brand used by chi chi Chefs like Chefs Tony Liu (Pulino’s), Nick Anderer (Maialino), Craig Hopson (Le Cirque), Marc Meyer (Cookshop, Five Points and Hundred Acres) and Andrew Feinberg (Bklyn Larder). If it’s good enough for Le Cirque, it’s good enough for Caliban’s Kitchen. Right? I decided to jump on the restaurant big wigs bandwagon and try these Jersey Farms. Of course, I leaped and then decided to take a look to see what I leapt into. Based on the package design, you might think you need to have your cans airdropped onto a hidden island aka Lost’s Dharma initiative. But in NYC you can actually find them at most of the usual suspect fancy grocery stores: Fresh Direct, Dean and Deluca, Stinky Bklyn, Greene Grape Provisions, Bklyn Larder, Union Market, The Brooklyn Kitchen, Court Street Grocers and Murray’s Cheese. My gut worried that this was going to be another expensive resource. At Fresh Direct, the tomatoes run $3.19/can. But there was a link on the Tasting Table page to buy now. They got me. I clicked and found myself at Primizie — Importer of Fine Foods. At Primizie a case of the case of 12 cans of tomatoes cost $27.99. That comes out to $2.35 a can. It’s not super cheap, but it’s cheaper than my bodega. The shipping charge was going to be about $11 but they offer free shipping for over $50. So I doubled my order. Plus I spoke to them and if you use the special Caliban’s Kitchen code you can get a great discount — use coupon code: CKITCHEN25 and you’ll receive $25 off a purchase of $50. Ok, 2 cases is a lot of tomatoes, but I figured, fresh tomatoes really won’t come until mid July if I’m lucky. So I’m investing in more veggie chili for the winter but also a few batches of early summer gazpacho – I hope these tomatoes are good. . . . Both Tasting Table and Primizie’s promised that these tomatoes are packed within 24 hours. That’s fresh. According to the Primizie: This can is filled with pure, vine-ripened, fresh field-grown tomatoes picked by a cooperative of six farmers in southern New Jersey. 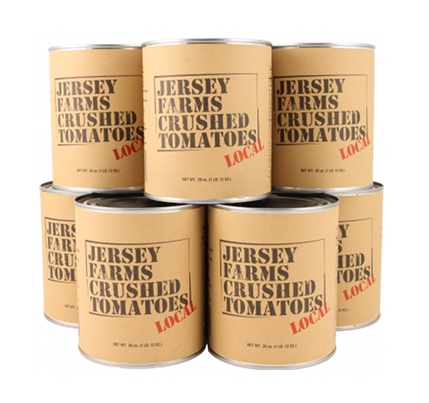 Once they’re off the vine, these Jersey Farms Crushed Tomatoes are canned within 24 hours, and a percentage of the sale of each can goes directly back to the hardworking farmers. I ordered the case between meetings. I had been meaning to do it for a week. At first glance I was excited by the fact that a percentage of the sales of each can goes back to the hardworking farmers but after I had a moment to stop and think, I wondered – why wouldn’t the farmers get money from the tomatoes. Something was off with that statement. I did an Internet search, and besides other bloggers waxing poetical about the lasagna or soup these tomatoes inspired, I couldn’t find any info about the growers. I started to wonder, who’s running this cooperative? Tony Soprano? 1)	I understand that these tomatoes are not organic, however, can you find out their farming philosophy? Do they use petro-chemical fertilizers? Are they low spray? Do they spray on demand, or do they spray as a preventative? 2) What kind of tomatoes do they can? Are they Roma or Beefsteak ? (Beefsteak’s what I think of when I think Jersey tomatoes) Do they ever use heirloom varieties? Or do they use any of those Italian types? Do they use any GMO seeds? This morning, I didn’t hear anything from Primizie. Again, I wasn’t surprised. So I sniffed around a bit more until I found a phone number at the New Jersey Department of Agriculture where Bill Walker was able to provide me a lot of great answers. I asked him some of my questions. He said, that no, the cooperative was not organic but that in general traditional farmers are not interested in using chemicals unless they have to. Chemicals are expensive and most farmers want to use them as little as possible. I have heard that before from other traditional farmers. But I’ve also heard from organic farmers that chemicals are not necessary. But that’s another story. Bill said that Jersey farmers are aware of the environmental implications and the potential hazard to the farm workers. According to Bill, New Jersey Farmers are interested in integrated pest management. He also told me something else I didn’t know, farmers who spray chemicals need to have a license. In order to keep that license they have to do courses at Rutgers Cooperative Extension every year to stay up to date. Interesting. Bill told me that the tomatoes are packed by the Violet packing plant – the only packers left in NJ. I wondered if that was the case. I’d talked to them before the last time I was researching NJ tomatoes – they pack Scalfani brand tomatoes. But what I found out today was that the Scalfani family actually owns the plant – although they may have sold it recently to a “big conglomerate.” I have a contact name to talk to at Violet – I’ll call them tomorrow and see if I can get some clarity. I’m also curious if Jersey Farms Crushed Tomatoes are the same tomatoes as the Scalfani brand. In any case, I still have a can of Scalfani, when my gazillion cans of Jersey Farms come, I’ll do a taste test. Maybe Primitive gives the farmer a percentage of their third. I’ll call tomorrow and see if Jaclyn or someone else can explain. In the meantime, my bumper crop of Jersey cans has just arrived. Apparently ground shipping from the Bronx takes less time than it takes me to post! 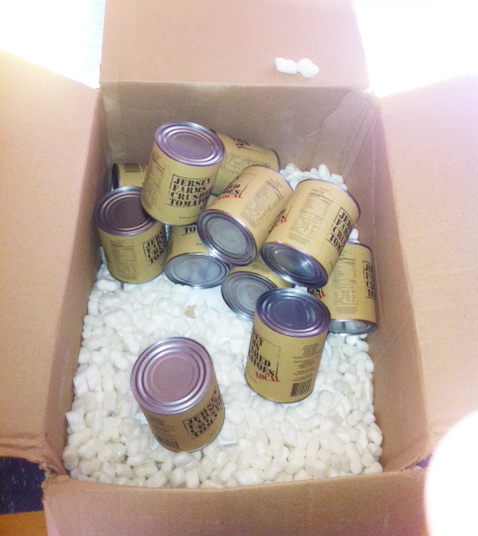 The final rub, the can were shipped in a big box filled with Styrofoam peanuts. Arggg. What did they think? The cans would break. My splurge of organic Black Kabuli Chick Peas (not local at all, I’m afraid) also came wrapped in bubble wrap! I did quickly speak to Primizie a few minutes ago and they said that they are working on using more environmentally friendly packaging materials but right now they can’t afford it. I appreciate that they are concerned, but I do think it would make me hesitate to order again. Unless, they will take my peanuts and bubble wrap back and reuse them. It’s unlikely, but hey, I can dream. There are many lessons to be learned from how things are done in the rest of the world. As in this case they come from Bogotá, Columbia where for over 10 years, they have been kicking cars out of the city — for one day at least.. Imagine the perspective we would all have if more of us were forced to rethink our favorite, gas-guzzling of mode of convenience — the private car. Even for those of us who don’t have a car this could make a huge impact — can you imagine a sultry, summer NYC day without the sound of city traffic. I would love to live in that New York moment. But until that time, here is my old au pair (and friend’s ) description of life in a big city on a car- free Thursday. 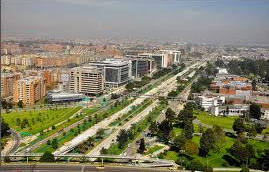 “Bogotá’s day for the clean air began in February of 2000 restricting the use of private cars from 6:30 a.m. until 7:30 p.m and motivating people to use alternative transportation such as bicycles, walking, skating or the use of public transportation. Later in October of 2000 the Mayor’s office made a public consultation asking register voters to decide about subjects such as the “no car day” and the daily restriction until 2015 with a positive result therefore holding the “day for the clean environment” on the first Thursday of February. This year on Thursday, February the 3rd in the “no car day” more than 1.000.000 “private use” cars were out of circulation and only school buses, taxis, public buses, motorcycles and cars with corporative logos were allowed on the streets. The city saved 30% of its regular gas production, mobility was better and you could see crowds of people riding their bikes to work. The weather helped us as it was sunny and it didn’t rain. Our massive transportation system “Transmilenio” had 1,7 million passengers that is 50.000 more than the same day the previous week and 2,6% higher than last year; yes it was crowded but not traumatic I found it relaxing as there was very light traffic and half the noises you usually would hear coming from the streets. On a sad note about 350 tickets were given for those who took their cars out, and there’s still people who voiced their discomfort in not being able to use their car one more day due to the fact that Bogotá has a daily restriction for vehicles depending on the last digit of their license plate twice a week. However in a city with more than 6 and a half million habitants it becomes necessary to stop the congestions that we used to face before the restriction was practiced. I think I mentioned that I broke down and started buying winter veggies at Whole Foods. Not a lot. And I am careful to avoid buying just anything. So a few days ago I sadly put back my Meyer Lemon when I realized it came from the Middle East. Sigh. But I have been buying organic lettuce and broccoli from California, and ironically hot house tomatoes from Maine. And, I have begun to buy some of the frozen kid-veggies I know will get eaten – peas, corn and the lima beans. So far, I’ve bought about 4 bags and I feel guilty every time – but I am not going to not feed my kids vegetables all winter because I did not plan and freeze enough of my summer share. Enter Winter Sun Farms. It’s exactly what I’ve been looking for – a local source of frozen or canned local, sustainable produce. Wow. Winter Sun Farms partners with local sustainable farms in order to bring to their CSA members a winter share of frozen vegetables once a month all winter long. You can chose two plans either from December through March or December through May. I spoke to Jim Hyland, the president yesterday and he told me that right now they have about 1300 members and that next year they hope to increase to about 2000. They are completely booked for the season, but I hope that next year I will be one of their new customers. Plus he also said that shares included fresh pea shoots from my own CSA farmer Ted Bloomgren at Windflower Farms. Nice. Like many CSA’s Winter Sun Farms is able to service their members by gathering their produce from many farms. Currently, according to Jim, they work with about 20 farms in the Hudson Valley. And what’s nice is that all the veggies come in individually bags labeled with the farm that produced it. Unlike your normal CSA summer share, these bags of veggies are partially prepared. The string beans are snapped. The tomatoes are stewed. Even the butternut squash is cut, peeled and puréed –– ready to become a quick winter soup. It sounds too easy to be sustainable. Of course, like all things convenient, the shares are not cheap. A primary share, which includes 4 months, costs $128. Add in the month of April and the cost goes up to $160. I did a quick calculation and that comes to a little over $4.50 a bag of veggies. It is probably more expensive than my Whole Foods frozen bags, but I would be more than willing to pay the extra money to be able to stay true to my principles over the winter. Jim says that they are looking to have more options in the future including ways to make their veggies more affordable. But until now, there was a lack of infrastructure for farms to package small products. In order to meet this need, this spring he opened the Farm to Table Kitchen up in Kingston, which will allow small farms to individually quick freeze their veggies or produce basic canned goods like local tomato sauces. “We are going to be dealing with local farms and giving them the ability to source that stuff,” Jim explained. 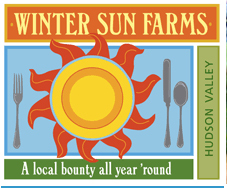 Winter Sun Farms CSA has tons of pick up locations both the Hudson Valley and Manhattan and Brooklyn. You can check here for a list. And they are also in the Saturday Farmer’s market in New Paltz this weekend and then again on March 12th. I can’t do this weekend, but I could see a road trip that includes a trip to Fleisher’s Organic Grass Fed and Organic Meat in nearby Kingston in my near future. Does Whole Foods have my back? Last Saturday I didn’t go to the farmer’s market. Last Saturday I was so tired from the workweek that I couldn’t find the strength to leave the house – in fact, I barely left the living room couch. I wasn’t in a rush to run up to Inwood. The week before, the market was so spare I left without much that I could use to feed the kids for the week and what I did buy was expensive and a bit iffy. The peel on the pears and apples was starting to buckle. The carrots, when I got them home, were limp as the tip. And the potatoes were pricey. My regular farm stand at the end of the market near the park had vanished. And the market manager admitted the closest green to be had were probably back at the Bodega on Broadway. I thought that I would at least find a cabbage but there was none to be had. The market manager said that she was trying to get greens in the market. She said kale was a winter crop and could be picked even in the dead of January. But when I asked the bio-dynamic farm vendor if they had Kale, she looked at me strangely. “The fields are frozen,” she said. I looked at the bleak selection in the stalls and felt my usual panic. Not having food freaks me out. Not being able to feed my kids puts me in a double panic. “I’ve been doing this local thing on my own,” I said to the market manager, “I need some sort of book. Kind of like a locavore for dummies.” She laughed. Then she thought for a moment. “I don’t know if there is one like that. But there are blogs and websites.” I wrote down the info on a recipe card and put it in my bag and pretty much forgot about it until yesterday when I was cleaning out my wallet for receipts for an expense report. In the meanwhile, since I didn’t go to the farmers market, I did go to Whole Foods. It was a mad house. I haven’t stopped shopping at Whole Foods since I shifted to a more farmer’s market mentality but I haven’t done a big shop there in months. I have to say it was a guilty pleasure. It was like being on vacation – everything was easy. And I had choice. Lots of stuff was organic. And by farmer’s market standards, things were less expensive. My whole shopping which included 3 chickens and a pound and a half of grass-fed local steak was under $150. The local mushrooms, which I normally pay $8.99/lb for at the farmers market, where only $3.99/lb. But here’s the part of last weeks farmer’s market that I forgot to mention. They guy who sells the mushrooms at the market normally isn’t very friendly. Normally, I get the sense I’m annoying him with my questions and he wishes I would just hurry up so that he could move on to the next customer. Last week when I bought my limp carrots and mushrooms from him, he seemed genuinely grateful to see me. He said “thank you,” but I could tell he really meant it. The article reports that Whole Foods when faced with the choice between full deregulation of GE alfalfa or conditional deregulation of it thought it was better to hedge our bets and hope the USDA to regulate GMO alfalfa so that non-GMO varieties are preserved. Shwartz goes on to say “Whole Foods also expects Monsanto to pay “the farmer for any losses related to the contamination of his crop”–a tactic that the OCA is referring to as paying hush money to farmers.” Ugg. The article also reports that according to the OCA, both Whole Foods and Stonyfield Farm’s CEOs are buddies with former Iowa governor and current USDA Secretary Tom Vilsack who has been seen traveling in Monsanto corporate jets on the campaign trail. Double ugg. (Via Fast Company) “As one of the brands mentioned in this article, we want to address the untrue claims made by the OCA that have unfortunately ended up in pieces like this one. Organic Valley does not have a relationship with Monsanto, nor did we come up with any sort of compromise or “deal” with them or the USDA. We’ve always advocated for the strongest restrictions against GMO alfalfa available, and have no interest in compromising with biotech. Here’s what really happened: over the past several months Secretary of Agriculture Tom Vilsack had asked for stakeholders to weigh-in on the USDA’s impending decision regarding GMO alfalfa, and we were a part of these talks. Organic Valley has advocated to keep GMO alfalfa off the market from the start, and this was originally an option according to the USDA. However, as of December, they had left only two options on the table: allowing unrestricted commercial growing, or partly restricted growing. When we understood the only options the USDA were open to considering involved the legal planting of GMO alfalfa, we knew we had a responsibility to advocate for the most restrictive set of regulations possible, so that farmers would have legal recourse in the face of contamination, and contamination could be avoided by mandating sizable buffer zones and geographical planting restrictions. To have taken any other route at that juncture would have been a clear abdication of our responsibility to our organic farmers and consumers. Walking away from the table was not an option, and would only have furthered Monsanto’s interests. We’ve not split with the rest of the organic community. On the contrary, we are uniting with several other organizations and companies against this GE alfalfa decision, and have co-signed a letter explaining our position and calling on consumers to join us: http://ov.coop/3h6. It was irresponsible of Ronnie Cummins and the OCA to make these false and unsubstantiated allegations during a time when organic farmers need our support, and unity is more important than ever. We expect an apology from him, and hope others investigate the facts before perpetuating this misinformation. After reading this, it’s pretty clear, the organic community was really up against a rock and a hard place. So in light of this kind of info do I boycott Whole Foods? Or do I enjoy the ease $1.39 a lb chicken? What I really wish is that I could boycott the USDA. They are the ones who really sold us out.